Is It Possible to Import a JDM MKIV Toyota Supra Turbo to the US? 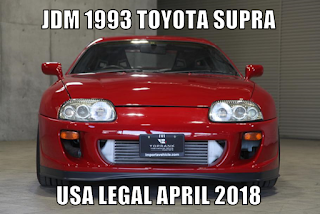 I just received this email question - "I was wondering if importing an JDM Mk4 Toyota Supra turbo would be possible to the US." The first thing I assume when someone says import, is that they want to legally import and be able to drive a car. Anything can be temporarily imported, but has to be exported within a certain amount of time. So, the first place to look, is on the NHTSA list of approved vehicles. http://www.nhtsa.gov/cars/rules/import/elig101012c.pdf . Looking though that PDF, no the Toyota Supra is not on the list. Of particular importance for something like a JDM Toyota Supra, is that the vehicle is right hand drive(RHD). That more or less says that you may need to crash test a right hand drive car. Unless Toyota says the right hand drive car and left hand drive car would preform the same in crash tests, they would want an RI to do their own dynamic testing. Toyota has nothing to win, everything to lose on a statement like this. So its unlikely of them agreeing with the statement. Some information on the Toyota Supra from Wikipedia. Again using subframe, suspension and drivetrain assemblies from the Z30 Soarer (Lexus SC300/400), test model pre-production started in December 1992 with 20 models, and official mass production began in April 1993. The new Supra was completely redesigned, with rounded body styling and featured two new engines: a naturally aspirated Toyota 2JZ-GE producing 220 hp (164 kW; 223 PS) at 5800 rpm and 210 lb·ft (280 N·m) at 4800 rpm of torque and a twin turbocharged Toyota 2JZ-GTE making 276 hp (206 kW; 280 PS) and 318 lb·ft (431 N·m) of torque for the Japanese version. 1993–1993.5 Mark IV Supra introduced with 2,997 cc (2.997 L; 182.9 cu in) turbo (2JZ-GTE) or non-turbo (2JZ-GE) DOHC engine. 1996 – Turbo only available with automatic transmission owing to OBD2 certification requirements. Targa roof standard on all turbo models. 1997 – Manual transmission available on turbo models. Restyled front bumper and grey (instead of black) taillight surrounds. Restyled headlights, now black on the inside with chrome rings (all chrome previously) and a clearer lens. All 1997 labeled as 15th Anniversary model. New grey dash panels to replace the previous black. Japanese production stopped in September. 1998 – Slight restyling of interior. 3-spoke steering wheel introduced. Slightly updated seat design (headrest is no longer separate) VVT-i on non-turbo models which increased power. Turbos not available in states that require California emissions. 1999 – Export of Mark IV Supra halted in the U.S., production in Japan continues. 2002 – Production of Mark IV Supra halts. Since the Supra was first mass produced starting in April 1993, it will be over 21 years old and EPA exempt in 2014. Over 25 years old and NHTSA exempt in April 2018. Want a legally imported Japanese vehicle? 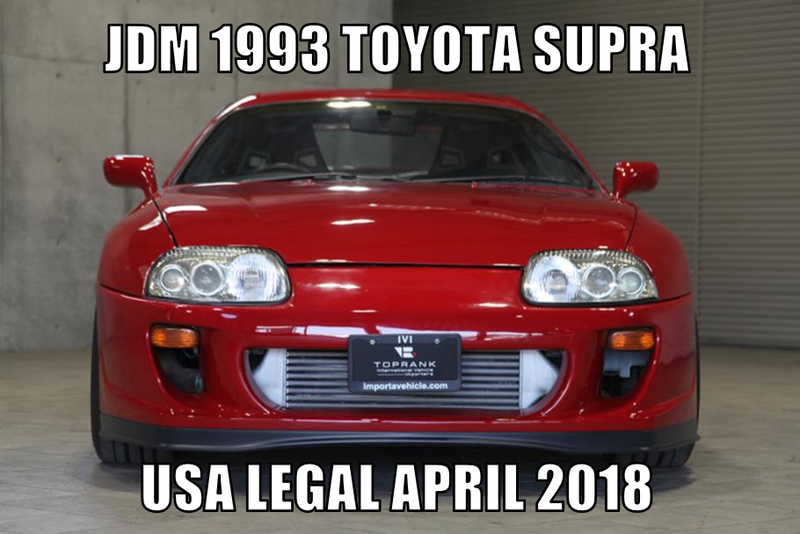 importavehicle.com imports legal JDM vehicles over 25 years old. Legally import cars from Japan, Australia, and Europe. Isn't the R33 GT-R still on the list as ok to import? No, the r32 is becoming legal this year. The car must be 25 years old or more. Its legal to import an R33. But there are modifications that need to be made to meet the regs to import one. Motorex crashed tested serval modified cars which is why its on the list. What if the car was converted to LHD? That would eliminate the LHD vs RHD dilemma. Not really. It would still have a Japanese or foreign VIN. They may accept it, but you would have to be able to provide proof that the conversion was as safe as a US model. The RHD Supra does not share the same chassis as the LHD car. The LHD Supra chassis is made by Deawoo unlike the RHD . It is a stiffer , more rigid chassis with differing material strengths for US impact safety standards . One may sermise that the RHD are not imported for this reason alone.